The Monterey Bay Sanctuary Scenic Trail is a proposed 32-mile trail in Santa Cruz County. 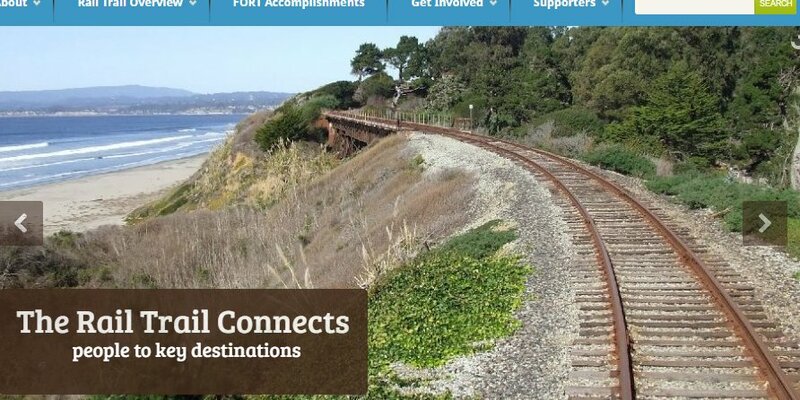 Some local groups advocate using the corridor for the trail alone. Others advocate for maintaining the railroad tracks in their current location with the trail adjacent. For the benefit of our community, we need a constructive conversation that honestly evaluates the pros and cons of each option — and one that accepts that good people can disagree about these factors. This table seeks to evaluate how the trail is impacted by each option. (Note: It does not evaluate the feasibility or desirability of passenger rail -- an important, but separate complex topic). Please add your thoughts! Width is restricted to 12' (8' with borders) for a large portion of the trail due to constraining physical features and finite right-of-way. Because a significant setback is required from the tracks, some locations do not have obvious solutions for fitting both rail and trail. For example, this screenshot from the FORT website. Wide enough for 16' or wider throughout (minimizing conflicts between different path users). Significant impacts due to additional retaining walls, required fencing, and needed removal of trees/greenery over most of the corridor. Largely unchanged from current aesthetic, except with a trail. Opportunities for tree planting exist. Due to fencing, entering and exiting trail is limited. This is significant in areas like Neary Lagoon where the trail passes key destinations like Chestnut/Depot Park, but access will be prevented because of fencing. Access is unrestricted. Trail users enter/exit the trail as needed. Significant increased cost of retaining walls. For example, retaining walls are about half of the Segment 7 $8M project cost. Additional cost for land fill/leveling projects (e.g. west side of Almar), fencing, tree/greenery removal, encroachment projects (e.g. New Leaf). Revenue or cost from removing tracks. Possible expense of repaying Prop 116 funds. Reduced maximum speed due to limited width on a mixed use trail. Some functional limitations due to access restrictions. Improved long-distance commute option if passenger rail is developed. Fewer limits on commuting speed due to reduced conflicts. Nature value Significant impacts due to increased concrete, fencing and engineered track bed. Improved due to less development and more nature. Recreational value Due to path increased conflicts due to narrower construction, access restrictions, and poorer aesthetics, the recreational value is reduced. Open, fenceless, tree-lined, linear park has significant advantages for creating a linear park. Community utilization Trail constraints increases potential for conflict and reduces appeal and thus probable utilization of the trail. Fewer constraints and a wider trail makes user-group conflicts less likely, and thus encourages greater use. Implementation Time Plans already exist for rail with trail, so that could expedite implementation. But potentially higher costs mean possible funding delays. Approval to remove tracks could delay implementation. But removing tracks could expedite project due to lower cost, and by removing some opposition from farmers and other adjacent landowners. While the table above is intended only to consider the merits of the options as they relate to the trail, it is certainly relevant to consider the transportation impacts of the options. Should the corridor be used for passenger rail on the current rail bed? Should another portion of the corridor be used for bus rapid transit? Should the county consider light rail on some combination of arterial streets and the Hwy 1? The answers to these questions are certainly relevant to the decision about how to proceed on the rail corridor. But they are outside the scope of the goals for this page's discussion. This table is being compiled by Ron Goodman, a board member of Bike Santa Cruz County. I am a supporter of sustainable transportation and community recreational facilities. I don't have a final position on trail with rail, trail only, or some combination. I have been involved in the process since People Power began advocating for local acquisition of the rail corridor circa 1991. My goal is to promote thoughtful discussion, to respect and trust the contributions of various individuals and groups, and to find a solution that best serves our community. The opinions presented on this page are those of the individual contributors and not necessarily of Bike Santa Cruz County or any other organization. Does something on this table seem wrong? Don't get upset! Instead, please send feedback and I will do my best to include it.